FoodPlay is coming to town! Schools around the country are teaming up with FOODPLAY to empower children with the skills they need to take charge of growing up healthy and fit. 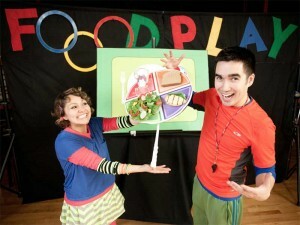 FOODPLAY, a national award-winning theater show promoting healthy eating and exercise habits, will be bringing its cast of colorful characters, fantastic feats of juggling, motivating messages, music, magic, and fun to Wyoming County thanks to a grant from Wyoming County Community Health Foundation. FoodPlay will be at two area elementary schools, Tunkhannock and Lackawanna Trail, during the week of September 24th through September 30th of this year. It will be a program during the day for all students in Kindergarten to 5th grade. While FOODPLAY makes good eating great fun, its messages are very serious. So serious, in fact, that First Lady, Michelle Obama, has launched the nation’s first childhood obesity task force, designed to tackle the alarming rise in the number of overweight children. In the last 25 years, childhood obesity rates have doubled among elementary school children and tripled among teenagers. One in three children are overweight, and less than two percent of the nation’s youth are meeting their daily nutritional requirements. Kids on average are drinking over 600 cans of soda and consuming more than 150 pounds of sugars a year, missing out on recommended levels of fruits, vegetables and whole grains needed for optimal health. During the fun-filled performance, children follow the antics of Johnny Junkfood, whose dream is to become a national juggling star, but keeps dropping the balls. The problem – his poor eating habits! With the help of the “Coach” of the National Junior Juggling Team and the audience of enthusiastic elementary school children, Johnny learns how to juggle the foods he eats to wind up with a balanced diet. Children learn how to see through TV commercials, decipher food labels, and make choices that are good for their health and good for the health of the planet. As the children walk away to the beat of “Treat Your Body Right! ” FOODPLAY’s message comes in loud and clear – feed healthy foods to your body, positive messages to your mind, and have fun being active every day! “We have to fight fire with fire, ” says FOODPLAY creator and Executive Director, Barbara Storper, MS, RD. A leader in children’s nutrition, Storper has reached over three million children at schools across the country with FOODPLAY, using the power of live theater to make nutrition come alive. Learn more about FoodPlay online. This entry was posted in Uncategorized on August 9, 2013 by superadmin.